Celebrate Fall Equinox Sound Healing Ritual on Tuesday, September 20th 7:00-9:00. Fall Equinox is the day where we have equal hours of darkness to equal hours of light. We will explore Balance within ourselves, to see where more love and balance are wished. Where do you need more grounding with the Earth in your life? Where do you wish more flow of emotions with the Water Element? How can there be more passion in Fire Element? When do you need to sing and laugh with the Air Element? Awny and Josey will be offering Purifications with the Sound Bars for everyone that comes! Please be on time for this! We will all craft our very own vision of the 4 Elements on stones washed by the ocean waves. I will be bringing stones from the Pescadero Beach for each person to draw Balance within your self connecting to the 4 Elements! Then we will have our Sound Healing opening up to these new insights and to empower ourselves. I will open Sacred Space and play the beautiful crystal bowl to sing our hearts songs together! We will give gratitude for the harvest of the bounties the Mother Earth. Please RSVP asap to hold a spot. Tell all your Sisters and Brothers and Please Forward! The cost is $20 This is a clean & sober event. The sun splashes light upon on the moist earth floor, laden with Redwood soft needles in Muir Woods on the California Coast. It smells fresh and fecund. It is very quiet with few people. I can hear my own breath flowing through my lungs releasing out into the low mists. I walk with great respect for these old Redwoods that grow only in Northern California and coastal Oregon. You will find them nowhere else in the world. I feel very blessed by this gift of being amongst them. The Redwood Trees are magical for me. They are old wise sages that know the secrets of the Earth Herself. They stand as some of the oldest trees on the planet. These trees are ancient giants, the tallest living beings on the Earth, reaching heights of up to 360 feet. Redwoods and Sequioias are also known for their longevity from 1000 years, and sometimes more than 2000 years. I feel very fortunate to be with these ancient trees of this land. The Redwoods are community trees because they grow in a circle with one another. Their roots grow intertwined and they speak to one another this way like a family that they are. They support each other in their roots and live in harmony together. The old Redwoods are the ancient ones that hold the stories of this land within their roots. They are great, great, great grandmothers who are patient with the little ones, us. They know all the peoples who have lived here throughout time. The Grandmother Trees wait until we listen and then she speaks. She tells of the changes in the Earth and all the earthquakes have been felt here on this land. She speaks of the peoples and tribes that have come and gone. She has seen many die for no reason and she witnesses our human choices and wonders why it is we are not more loving to one an other. The Redwoods are wise because their branches stretch up into the stars. They know of the cosmos mysteries and at the same time all our history below upon the Earth. I walk along the path and a branch from one huge Tree brushes my arm, I am invited to touch its furry red bark. I feel humbled as I try and wrap my arms around its massive trunk that would take twelve people stretching around to complete the hug! My heart presses against this incredible ancient one. I can feel a presence within the tree itself. I can feel the spirit of this tree. I sense the strength and power within it. I ask, “Is this possible for me?” The Redwood tree says, “Yes, Mother Earth loves you, too, very much and the sun shines loving golden rays upon your head every day.” I have such gratitude being reminded by this great tree how easy it is to feel that I am a part of great Mother Earth. The Redwoods teach me to receive the love that is here every moment for all of us. 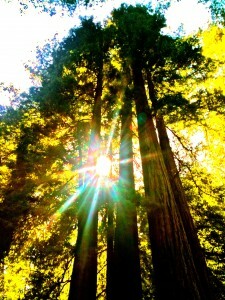 I have adoration for the beauty and wisdom of the redwoods. I have great respect for them and I am in awe of them. I continue my walk through this forest of Redwoods until I come upon a tree where its insides have been burned away from a fire long ago. The Redwood’s insides are still charred black like a dark cave or womb inside the Redwood tree. I wonder if this Tree has been greatly wounded? I walk into the center of this burned out hearth and I feel a whoosh of energy flowing through me, through the tree and into the sky! This is the energy of Mother Earth and the heart of the tree moving from earth to sun above, this is the magical energy of the Redwood Trees’ Love. I have heard that the tree gnomes sometimes live inside these burned out hearths in the Redwoods and I would like to meet them. I sit down at the center of the cave within the tree. I open my third eye, allowing me to see beyond the veils. I call sweetly to them to come, “Hello Tree Gnomes, please come and play.” and wait patiently. I notice a flash of something out of the corner of my eye. I turn in that direction and don’t see anything, but three small cones fall onto my head out of nowhere! “Ahwwwoo!” I yell, even though it didn’t really hurt. I take this as a sign I have been acknowledged. I ask them to come and play with me and next I see a shiny object on the ground that I had not seen before. I pick it up and see that it is a single earring made out of cloisonné with the moon and stars embedded. “Wow, this is really pretty! Thank you.” I say out loud. I feel honored and take it as a present. I place this very special gift in my pocket and say “Thank you”. I continue on my walk, knowing I will be back to this Redwood tree again to visit with the tree gnomes! These Redwoods are great teachers, revealing their secrets to all of us who wish to lovingly touch the red earthen colored bark, its furry textures soft and generous. I continue my walk through the old grove to seek out fallen branches to use as ceremonial power sticks. I will be leading a group of woman learning the ways of shamanism that I teach. I wish to present the redwood branches as the power sticks to create our connection to Spirit. I look amongst the branches on the ground, surrounding one old, big Redwood and I find the perfect ones. I pick up the branches and walk up to the massive Redwood. I place my cheek upon its soft reddened bark and ask its permission to use these wonderful branches from its body. I whisper to the tree with my face pressed close, “I am leading women in the ways of shamanism and we wish to embody your powerful energy in the making of shamanic power sticks. May we have permission to lovingly use the branches you have let go of ?” The Redwood answers in my heart as I look up, my head tilting back as far as it can go. I marvel at the height of this wondrous tree. I can see the sun shining though its top branches, streaming into my eyes. I feel the answer, “Yes child, this is a good opening for the women to see my strength in themselves. You may take a branch for each of the women, so they may carry my energies within them.” I wrap my arms around this Tree, trying to reach its wide berth, barely making it one fifth around. I hug this ancient one and thank it with love as my chest presses into its reddish body. “Thank you Oh Great One.” I say out loud. This Redwood tree then tells me, “No one has ever in my many years ever touched me and spoke to me like you have done today. I am very happy and surprised to be seen and honored. This is a sign that times are changing and that the humankind is awakening. They are awakening to see that we are all alive as they are, and can be seen as equally as important as they are!” The Redwood tells me it has shared this sign of awakening happily with the other trees in its circle. It shares my love, blessings and gratitude with the other Redwood trees. I feel such reverence for these ancient Redwoods. I hike the trail back through this magical, enchanted forest winding through the beautiful Muir Woods. I walk down to the sweet water wending its way through the base of the woods. I stop and take in the beauty of the trickling sounds of water over rocks and the crows cawing in the trees above. I decide to stop and give a song of gratitude to the waters and Redwoods and begin singing a Hindu prayer of Om Shanti. “Om” meaning “The sacred sound of the All That Is” and “Shanti” meaning “Peace.” I sing a soft melody with the sacred song creating a vibrating “Oooommmm Shaaaaaanti”. I sing and chant till the crows caw with me and we sing together. I am connected to these amazing Redwoods with all my heart. I tell the redwoods that I love them and they continue to speak with me. I invite you to open your heart when you are in the Redwood Forest next time you are there. Stop and press your heart to the red furry bark and let your cheek feel their softness touch your skin. Let your mind send loving thoughts and heartfelt gratitude. Open up and ask these sacred Ones your deepest longings and hear the answers. I promise if your heart is open, you will hear the wise and loving messages, given. I don’t think I could live anywhere else but here in the Bay Area because I need to be near the Redwood Trees and yes, I admit I am a California Tree Hugger!